MEYLE rubber-to-metal parts – bonded to last. Whether neutralising engine vibration or providing a firm connection between components and assemblies: MEYLE rubber-to-metal parts are designed to do an outstanding job. All materials and components are chosen to suit each model's bespoke characteristics and ideally matched to the respective vehicle make. Our manufacturing processes are distinguished by the use of highest-precision tooling, utmost cleanliness during metal part pretreatment and made-to-measure vulcanisation process parameters. This is complemented by a final calibration procedure for control arm bushings which further increases part quality and delivers a service life 10,000 times longer than for non-calibrated bushings. MEYLE rubber-to-metal parts for vans. A multi-functional design with excellent load-carrying capabilities available for a wide range of makes and models – this is the essence of MEYLE quality. With the MEYLE-HD transmission mount for Mercedes-Benz applications we have merged the various designs found in a number of OE model variants into one single part and, in this process, reinforced overall part structure, fine-tuned the rubber compound mixture and improved the damping characteristics. The MEYLE engine mounts are equally advanced, featuring optimised rubber-to-metal geometries, vibration-free engine suspension and an exceptionally long service life. Several tests have shown: MEYLE engine mounts are more than a match for their original rivals. 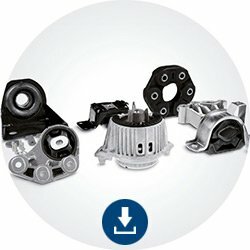 about rubber-to-metal parts as download files.